Jurgen Klopp insists his decision to substitute Xherdan Shaqiri at half-time against Southampton was merely in view of adding more defensive stability. The Swiss international was finally handed his full debut at Anfield on Saturday after signing for the club from Stoke City during the summer transfer window. 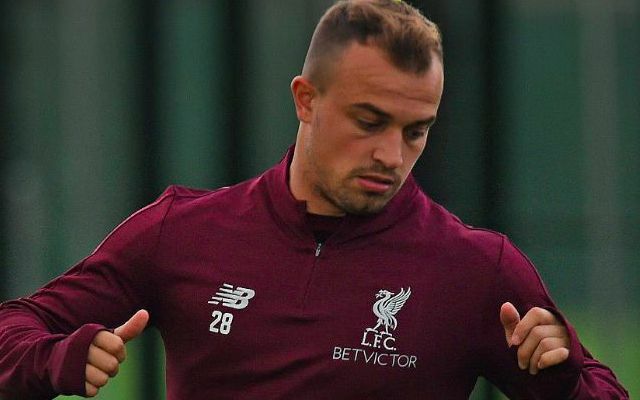 A prolonged wait for his first start has been down to the Reds’ 100% record more so than Shaqiri’s form, with the playmaker having evidently made a bright impression both in training and throughout pre-season. Klopp was immediately rewarded for his faith as Shaqiri helped orchestrate a dominant first half display, in which the Reds scored all three of their unanswered goals. The German’s subsequent decision to bring the £13million man off during the interval proved somewhat surprising. “Usually I don’t explain substitutions at half-time but I thought it made sense,” Klopp told Liverpoolfc.com. Shaqiri featured in arguably as attacking a starting lineup as Klopp has fielded since his use of Philippe Coutinho behind Liverpool’s front three. The 26-year-old served up a teasing reminder of the strength in depth Klopp has at his disposal as he looks to juggle a Premier League title charge with domestic cup competitions and the Champions League. It was his industry across the pitch in both hunting the ball and demanding it in view of creating chances that perhaps impressed more than his two assists. A willingness to receive the ball and initiate attacks in central positions previewed his value as a no.10 in Liverpool’s system, further easing concerns over a failure to sign an orthodox Coutinho replacement in the summer. He could be in line to earn another start when the Reds face Chelsea in the League Cup on Wednesday.